This year's Samsung Developer's Conference (SDC) has been interesting already. This is mainly due to the Infinity Flex Display that had finally been confirmed during the event's first day. However, other SDC presenters made announcements that indicate that Samsung also has non-foldable displays in the works - with notches. The 2018 Samsung Developer's Conference (SDC) has been noteworthy already as it officially unveiled the Infinity Flex Display as part of the company's smartphone future. This new technology makes foldable devices like the putative Galaxy F (or possibly Galaxy X) possible. However, it appears that the company has something rather more conventional in mind for other, more rigid future models. 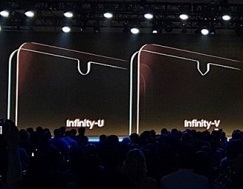 For example, Samsung also announced that it is contemplating its own take on the notch for next generations of the Infinity Display. The current iterations, found on devices like the Galaxy Note 9, relies on top and bottom chins to generate an otherwise bezel-free display. However, it appears that Samsung may resort to notched versions of this screen technology in order to take these chins away. The results include the Infinity U prototype display, which has a notch much like that of the Essential phone. The Infinity V display has a similar, but much more angular, central notch. This part of the SDC was not all bad news for opponents of the notch. 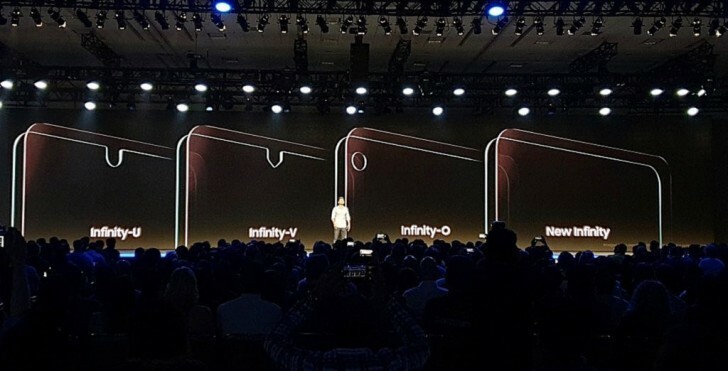 It also introduced the Infinity O concept. This screen, like its purported OPPO and LG counterparts, has a cut-out for an in-display front-facing camera. Therefore, it appears that Samsung fans may have quite a choice of Infinity Display variants in the future.